Red Devil Motors: A NUT or not? Here a photo of a vintage combo on a very evocative cobbled street of terraced houses. 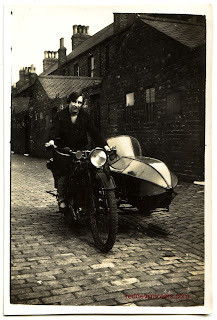 The definition on the picture is poor but if I was pushed to give an identification I would go for a NUT (Newcastle Upon Tyne) from the early twenties. If anyone out there can give a positive id please do get in touch.